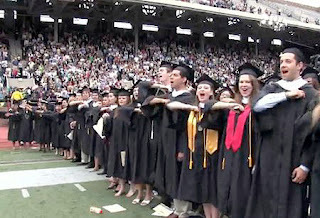 Over the past 2 days I've posted videos from the stage of Jon Huntsman Jr.'s and President Amy Gutmann's commencement addresses to the Class of 2010. Yesterday, I posted the enthusiastic commencement speech given by Jon Huntsman Jr. at Penn's 254th graduation ceremonies from this past Monday. Today, I have Penn President Dr. Amy Gutmann's 2010 Commencement Address to share. Again, I encourage everyone to listen to this speech. It's a great source of inspiration! After the jump find out why Dr. Gutmann thinks perfection is overrated. 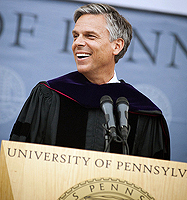 This past Monday, Penn hosted its 254th Commencement and Penn alum Jon Huntsman, Jr. (C'87), Ambassador to China, delivered the Commencement Address. ...However, I do encourage you to listen to these speeches as they really are a source of great inspiration no matter how old you are! After the jump, find out some key moments from Jon's enthusiastic commencement speech including how he worked in an Incubus song and his "ooh"-invoking comment about how beautiful President Amy Gutmann's looked! Since my filmmaking days at Penn, technology has changed in such a way that the films the students put out these days look really very professional. That said, last week, Brian Tran (W'10) (and former "Penn in Cannes 2009" correspondent) let me know about a new reinterpretation of Lady Gaga's "Speechless" music video he and his friends Kevin McAleer (C'10), and Maddy Dopico (C'13) put together for a class project. What is the meaning of this video? "Our actual goal is eventually get enough hits on the video to have it get passed onto Lady Gaga herself. The meaning of the video itself it pretty convoluted, much like Lady Gaga's videos. We tried to pay homage to her and her aesthetic as well as other films such as Weekend at Bernie's and Misery . The more pretentious meaning of the video is it is a commentary on alcoholism and binge drinking in youth culture. In the past, drinking has covered personal intimate problems, but now, with this generation, alcohol and certainly drugs serves to eclipse a larger, macro fear, stemming from a childhood in the age of terror. This is why every time a character drinks to excess, they lose their voice (hence the subtitles) and their ability to communicate with other characters. The main character is in love with his straight best friend and after repeated failed efforts to win his heart, decides that the only reasonable course of action is to get his friend blackout drunk to fulfill his perfect dream life. Alcohol is used as a means to an end, but it doesn't succeed in the film."